You are the primary focus at RunnerDude’s Fitness. RunnerDude’s Fitness is not distracted with selling supplements or shakes. Your running and/or fitness goals are our goals. I am here to support you and guide you along your running and fitness journey. I want to know your goals and aspirations. I also want to know you as a person not just as a client. Fitness is a wonderful part of a full and healthy life, but it’s not always easy, especially when you first start. RunnerDude’s Fitness understands that and we are there for you every step of the way. Whether you choose one-on-one personal fitness training or small-group personal training in the studio or one of group running programs, you’ll receive personal attention and a customized training plan unique to your running or fitness needs and goals. Thad McLaurin (aka: RunnerDude), his wife Mitzi, and their three kids have lived in Greensboro, NC since 1998. He’s come a long way since being “that overweight kid” as a youngster. After Weight Watchers® and a 40-pound weight loss in high school, he discovered running during college and has been passionate about running and fitness ever since. (Over 30 years!) It all started with the ’84 Great Raleigh Road Race 10K. He wasn’t fast, but he had a blast and was hooked. 13 years later, Thad caught the marathon bug. His marathon quest began with the ’97 NYC Marathon. Twelve years later, he’s run 15 marathons all over the country from NYC to Baltimore to Nashville to Honolulu, and then some as well as on 50K Ultra Marathon. A UNC Chapel Hill grad, Thad began his career as a 5th grade teacher before moving into the world of Educational publishing where he worked as a writer, editor, and book development manager for 13 years. 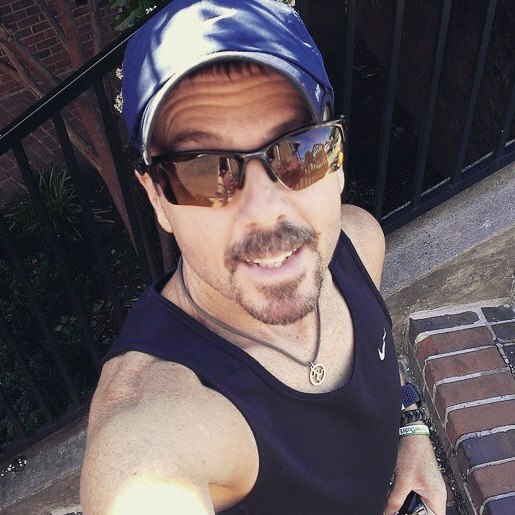 Thad combines his love of writing with his love of running and fitness by hosting RunnerDude’s Blog, one of the top-ranked running blogs in the country and he’s authored the book Full-Body Fitness for Runners (a USA Best Book Awards Finalist). Thad’s a contributing writing for Active.com and he’s also written articles for AmateurEndurance.com and Fitter U Fitness, and Canada’s IMPACT Magazine. as well as being featured in the “Ask the Experts” section of the July 2010 and May 2015 issues of Runner’s World. Thad’s also active in the community and has been a member of the executive board for GOFAR, a nonprofit organization that prepares youngsters to run their first 5K! He also contributed to the GOFAR instructor curriculum manual. Thad’s biggest reward is helping others get hooked on running, fitness, and healthy living. He is well credentialed with his Personal Trainer and Nutrition Consultant diploma certifications from NPTI (National Personal Trainer Institute), his ACSM (American College of Sports Medicine) personal trainer certification, his RRCA Running Coach certification, and his USA-Track & Field Level 1 Coaching certification. He’s also current with his Red Cross adult CPR/AED and First Aid training. Hear what some of our clients have to say about RunnerDude’s fitness. Click Here. Learn more about the RunnerDude Way. Click Here. Learn more about the RunnerDude Family. Click Here.